This is the Backwards edition of WFMW, where I get to post a question and you can answer. Please stop by Rocks In My Dryer, for more Q & A’s. With the prices of everything going up at the grocery store, everyone I know is trying to stretch their dollars and food. Milk is hovering at around $4.00 a gallon again, and it pains me to pay that much for it. So I was reading about powdered milk, and you can get a large box of it fairly cheap. I’ve never tried it before, so I’d like any advice at all. Thanks! We’re only on day 4 of summer vacation here, and I’ve already questioned myself on why I was in such a hurry for it to arrive. For some strange reason my oldest two kids think they need to be entertained every waking hour they’re up. “What are we gonna do today?” “What are we gonna do now?” These questions are a common phrase. Followed by “what’s for lunch?” Don’t even think about a sandwich or bowl of soup, because that’s not what they want. It seems that whatever I offer, it’s not the right choice for them. I have found a few things that are helping me keep my sanity, so I’m sharing them with you and everyone over at Rocks In My Dryer. For my pre-teen daughter, the lifesaver has been texting on her new cell phone (spoiled rotten brat touch phone). Also instant messaging on the computer. It’s all about communicating with friends! My oldest son is in basketball camp right after lunch, and then he’s been keeping busy with daddy at work. Then there’s the water balloon fights. If you were to walk up our front sidewalk right now, you’d see many brightly colored balloons lying around. We’ve had lots of fun inventing new games with them. We also spend time swimming, and making art with sidewalk chalk. Those are things that everyone has fun with. Today everyone was bored and the house was a mess, so I initiated the 20 minute tidy. I set the timer and told them we had 20 minutes to pick up and put things away. The only one who whined about it was Zach, and he quit once we had a talk about the attitude. He even mopped the kitchen floor without being asked, and after the timer went off! I’ll do that one again. Hope you find something that works for you, and you have an enjoyable summer with the kids. I have an old tractor tire in the back yard that the previous owner had planted flowers in. I broke up the soil and filled it in with potting soil and fertilizer, then planted a couple of tomato plants, peppers and a cucumber. There’s also a watermelon in the middle. Then I have a tomoato plant that I bought in a large container that is meant to stay. I have 3 lettuce bowls/planters in the front of the house, growing romaine, red leaf lettuce, spinach and parsley. We have had salads with dinner twice now, and leftover lettuce in the fridge for another. I have spinach that needs to be cut now, and the new lettuce is growing in!!! I am so excited to not have to buy the expensive bagged salads now!! In doing a little research, I found that lettuce is very hardy and grows well like this. I have 4 big planters left to fill with soil and a couple more cucumber and zucchini plants when payday rolls around. The tire and planters are also not easy for rabbits to get to since they are elevated. If you’re like me and want to grow your own food, I suggest you try this. It’s fun and easy! The weeds are not taking over any of it, and I’m seeing fruits of my labor! This weeks edition is a little different. I’m supposed to share what Doesn’t work for me. I’m feeling lousy right now, so my list might include some whining. My apologies. What doesn’t work for me..
1. My homemade pizza dough never rises. Could it be that I am just too impatient to wait for it to rise? Maybe. Or maybe I just like trying to stretch it to enormous lengths without making holes in it! 2. My husband going out of town for business and leaving me to single parent our 3 kids. Why does he get to have great dinners out while we eat cereal and frozen chicken nuggets? 3. Transferring my photos from my digital camera card to the computer. It’s not hard at all, but I just can’t seem to stay on top of it. 4. Overcommitting myself. It doesn’t work for me to say yes to so many things at the same time. 6. Much to my dismay, clipping coupons does not work for me. I have a stack waiting to be clipped right now. 7. Relying on my kids to pick up after themselves. Is it really too much to ask? 8. Losing weight and exercising. I’m personally not comfortable with my weight, but I think my body is. It keeps going back to it’s comfortable weight. Could it be the chocolate addiction? 9. Not having a meal plan doesn’t work for me. If I don’t have one, I’ll start thinking about what’s for dinner around 5 pm, or when someone asks me that question…” what’s for dinner”? 10. This ear infection doesn’t work for me. The ringing is driving me crazy and I can’t even think. If you’ve made it this far, Thanks! For more insightful ideas, please visit Rocks In My Dryer. We have a new Christian book store in town, and I’ve spent some time perusing the aisles. I was actually glad to see a few chairs provided for people just like me! I’ve been known to lose track of time in book stores while sitting on my knees checking out the bottom row of books. I digress! Anyway, I’m always looking for a good devotional or book to read to my kids that they can follow, and that tells the story of salvation. Well, I’ve found it, and I’m gonna share it with you. The Jesus Storybook Bible, written by Sally Lloyd-Jones is awesome! The stories are short and factual, the photos are bright and vivid, and it is easy to follow. It is for ages 4 to 8, but even my older kids love to hear the stories. My 4 year old is enthralled by it, and wants me to read more and more. This hardbound book by Zonderkidz is well worth the money, and it works for me when it comes to teaching my kids the story of Jesus. 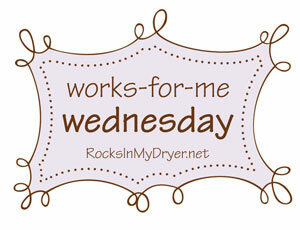 Head on over to Rocks in my Dryer for more tips!